The return of NFL football kicks into full gear this week and continues with a battle between the Tampa Bay Buccaneers and Cincinnati Bengals. Preseason games are a time for teams to find out exactly who will be playing for them, whether it be specialists, rotational guys, or full time starters. 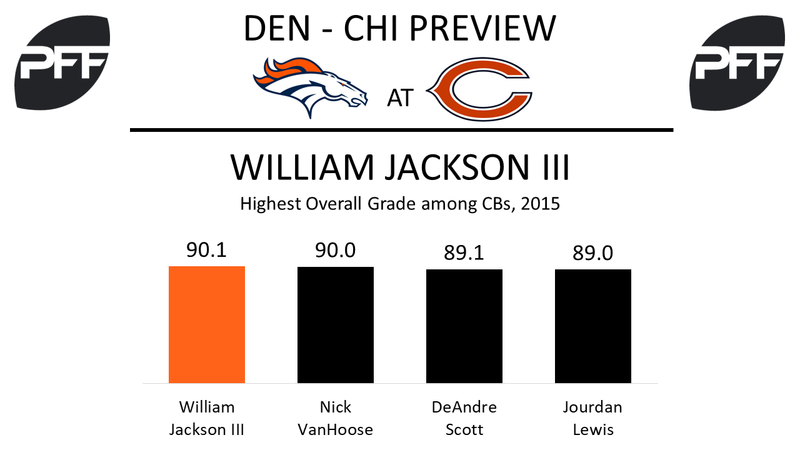 Below, PFF’s team of analysts have all the most important position battles and players to watch during today’s game. 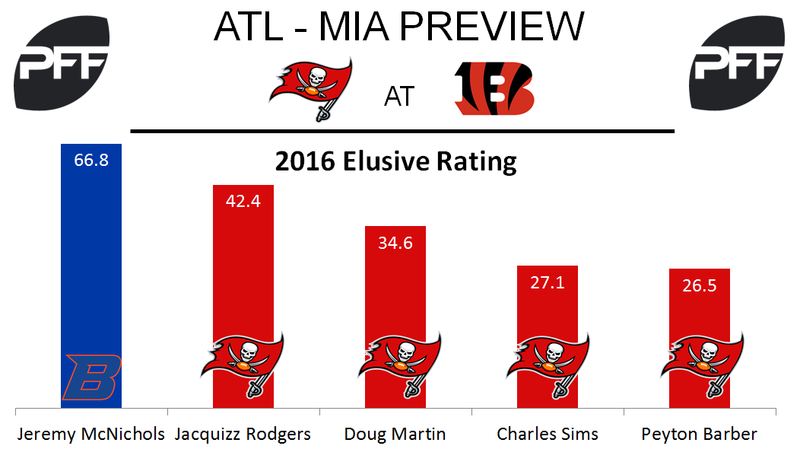 With running back Doug Martin suspended for the first three games of the 2017 season, there is an opening for the early season starting running back position in the Bucs’ offense and possibly more given reports that Martin is not guaranteed the starting position upon return. Rodgers is the longest-tenured NFL player among the group and earned the highest PFF grade among Tampa Bay running backs last season with a grade of 81.6. Sims has been an effective back in the passing game and is coming off a season where he ranked ninth in the NFL in yards per route run at 1.57 YPRR. Barber played on just 136 offensive snaps last season and finished third on the team in yards after contact per attempt at 2.27 Yco/Att. The Bucs spent their fifth-round pick in the 2017 draft on McNichols out of Boise St. He ranked eighth in yards per route run among the 2017 running back draft class at 1.88 YPRR. The former Alabama standout, TE O.J. 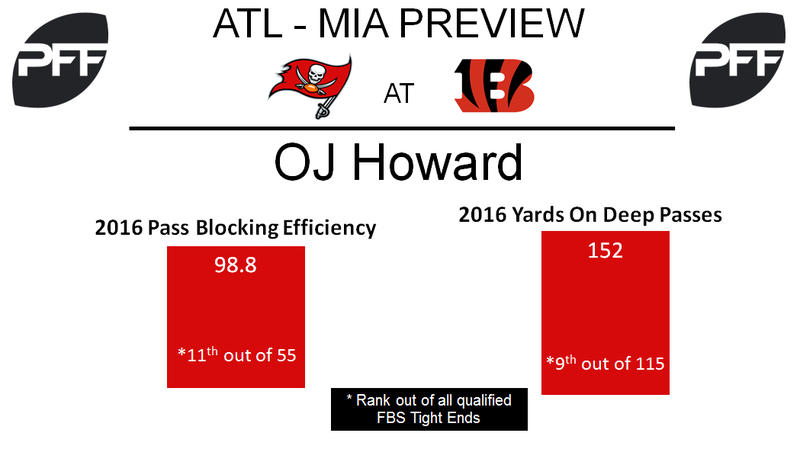 Howard was the Bucs first round pick and 18th selection overall in the 2017 draft. Widely considered by many scouts as the top tight end prospect in this year’s draft, Howard comes to Tampa as an excellent receiver as well as an outstanding blocker. Howard ranked eleventh out of 55 qualified tight ends in the NCAA last season in yards on deep passes (targets of twenty or more yards downfield) with 152 yards on just four receptions. To go along with his deep receiving prowess, Howard ranked ninth out of 115 qualified tight ends in the NCAA in pass blocking efficiency (a rating measure of pressures allowed on per-snap basis with weighting toward sacks) at a rating of 98.8 including allowing just one total pressure on 63 pass block snaps. This week’s match up will also likely be our first live look at 2017 third-round pick out of Penn St., wide receiver Chris Godwin. Godwin has been receiving strong praise all offseason including drawing comparisons to Roddy White. Last season Godwin ranked 12th out of 264 qualified receivers in wide receiver rating (quarterback rating when targeted) at an elite rating of 135.1. Where Godwin really excelled was on deep passes as he finished 21st in deep passing yards with 504 yards on such passes. Bernard is coming off of a torn ACL last season, but he’s already back in the mix at training camp and looking to pick up where he left off as the team’s primary passing-down back. Meanwhile, Hill has to be feeling some added pressure to produce, especially after a 2016 season where he and Bernard finished outside of the top 40 in elusive rating among running backs and out of the top 30 in overall grade among running backs. 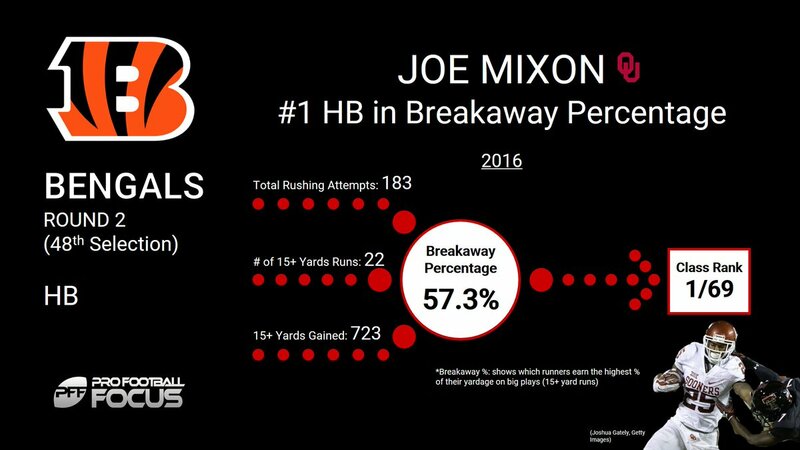 Mixon comes in as one of the top all-around running backs in college football last season, ready to take snaps away from the veterans in year one. He finished first in yards per route run (2.83) and breakaway percentage (57.3-percent) and second in pass blocking efficiency (98.4) among all drafted running backs. The rookie is the favorite to take over the starting role, but it remains to be seen how the Bengals are going to split up the rotation and find playing time for all of their talent at running backs. The Bengals offensive line has some real question marks on paper, but Hopkins is making a case for himself to provide at least one answer. The former undrafted free agent out of Texas made his regular season debut in his third year last season with 10 snaps in Week 17, but he’s been praised this offseason for his versatility and development, and Hopkins might just show enough to start at right guard and kick Andre Smith back to right tackle. Jackson tore his pectoral last year and missed his entire rookie season, but the first-round pick is back to full strength and ready to get his NFL career back on track. In his last season at the University of Houston, he earned a 90.1 overall grade, the highest of any cornerback in the country. Adam Jones is set to be suspended for Week 1 of the regular season, and Jackson is in prime position to make his NFL debut as a starter and give the Bengals plenty of reason to keep him there. Lawson was the 14th player on the PFF big board before the draft and fell to the Bengals in the fourth round because of some injury concerns. He’s already making waves in training camp, showing off his repertoire of pass-rushing moves that helped him generate a sack, hit or hurry once every 5.4 pass-rushing attempts in 2016 at Auburn. He can do some major damage in the rotation at defensive end.